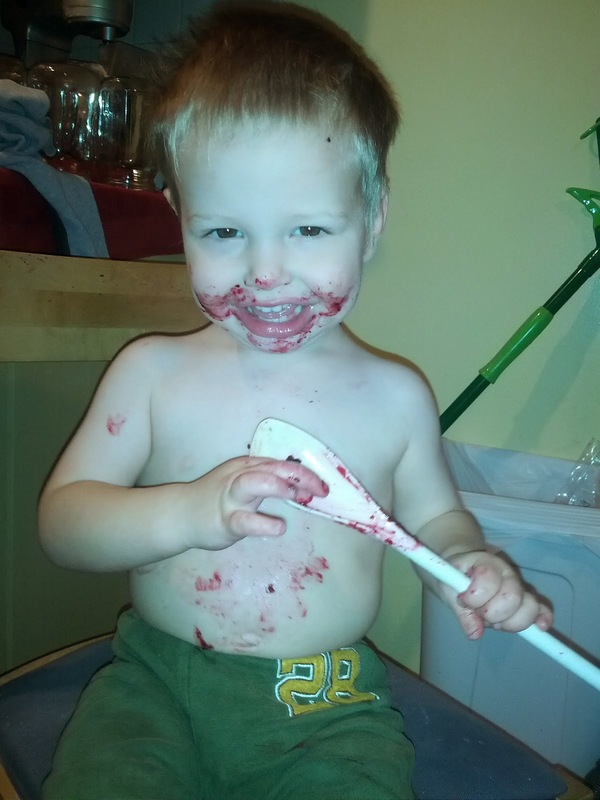 B is now two years old. He loves bikes, trains, tractors, popcorn, tickling, running, jumping, playing at the park, Shadow, books, being outside, large vehicles, rocks, and anything Eloise is playing with. He is very excited about discovering the world right now. 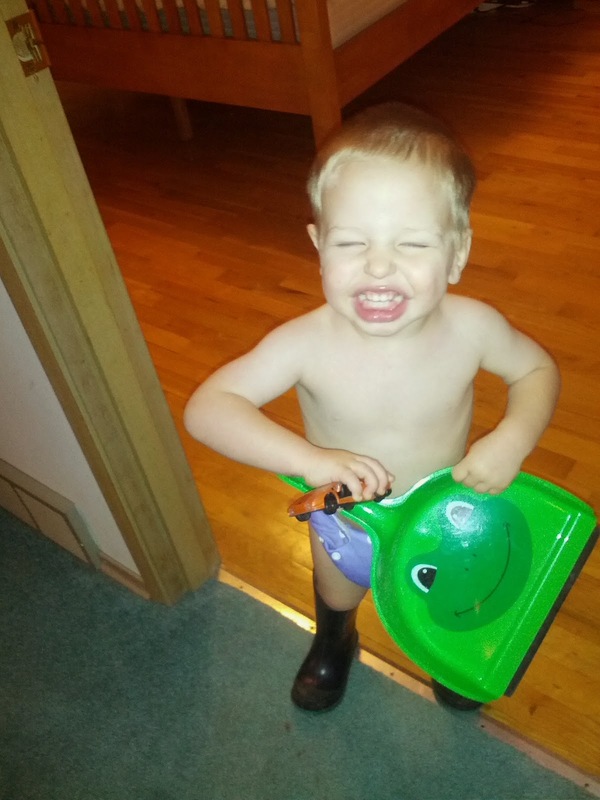 His two favorite phrases are "Look, Mommy! Look!" and "Stop! Don't do that!" accompanied by the outstretched "stop" palm. He enjoys the PBS show "Dinosaur Train," more for the train than for the dinosaurs. I wonder how long it will take him to stop yelling "Choo! Choo! Ain!" every time he sees any depiction of a dinosaur. He is very independent and prefers to have the chance to try things like putting on shoes and jackets by himself before he asks for help. He usually doesn't want Jared or Eloise to help him with anything, always (justifiably) suspecting them of malicious intent. B loves having his picture taken. 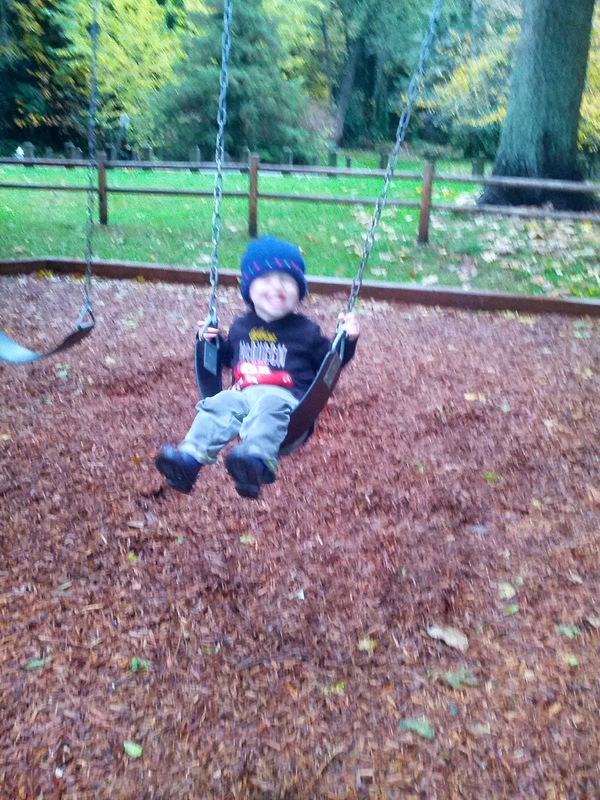 Any mention of the word "smile" or "camera" has him making his hammiest faces. 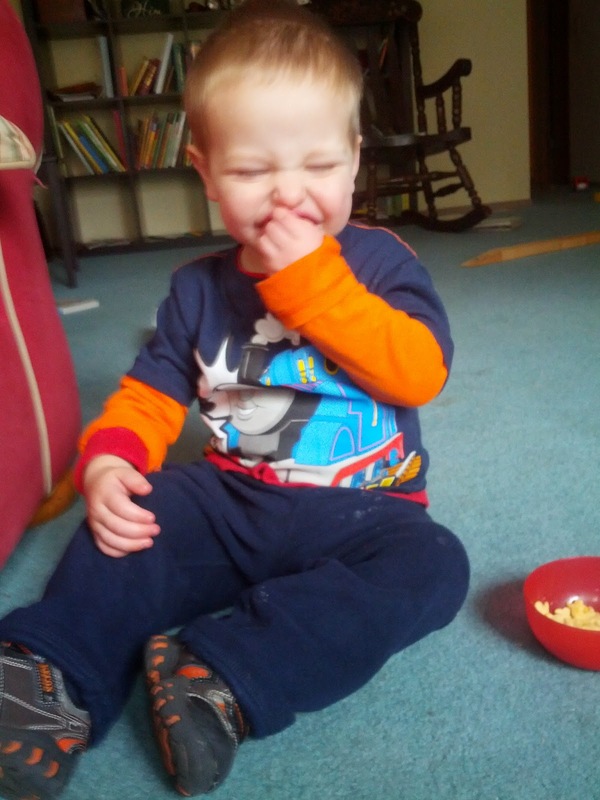 B got two train shirts for his birthday, one from Mom and Dad, and one from Grandma and Grandpa. 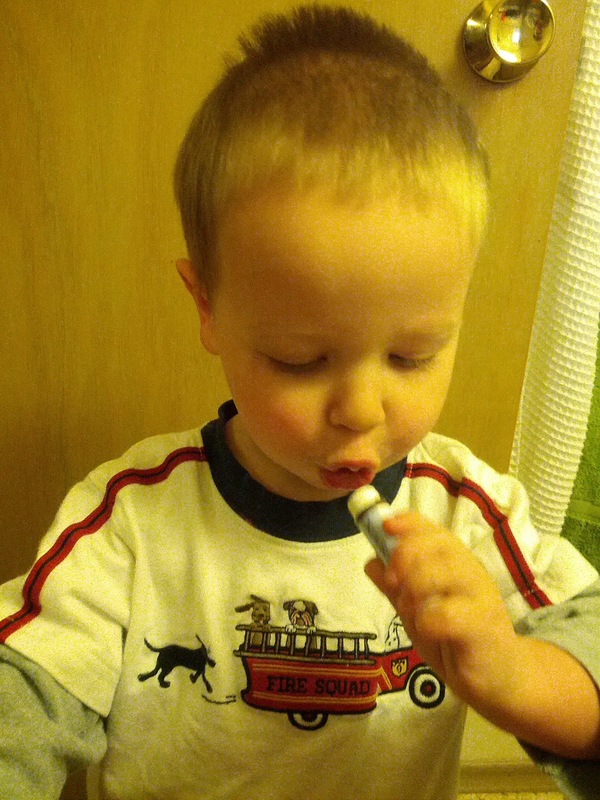 I got him a train shirt because he spends many minutes every morning looking through his shirt drawer for a train shirt, which he did not have until now. When he opened the second train shirt gift, he was already wearing the first one, but he insisted on putting on the second one as well. Two is better than one. 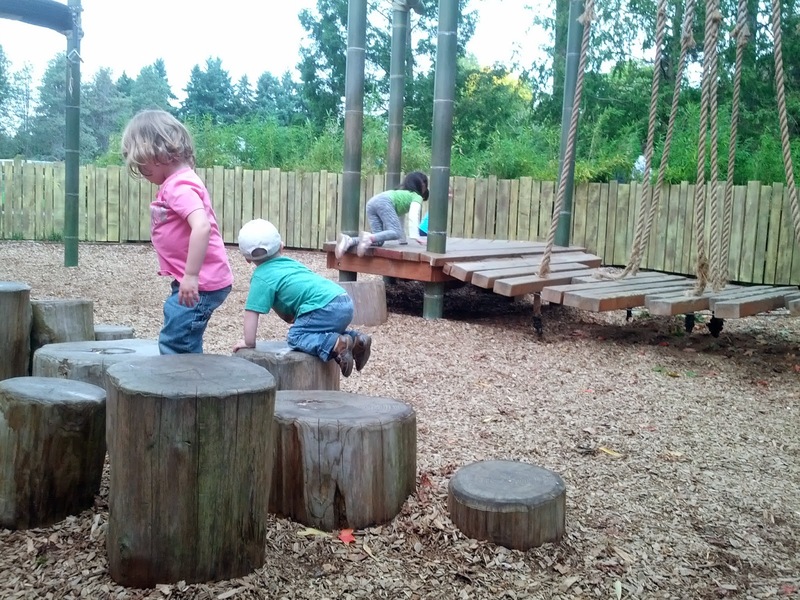 B loves to play with friends, and is very good at remembering the names of the children he meets so that he can ask to play with them all of the time. 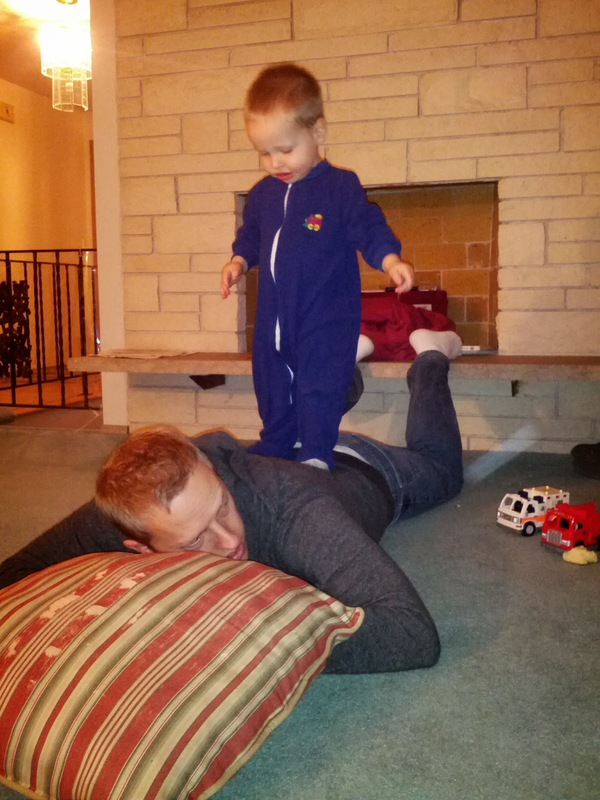 Unfortunately, the defining feature of this particular birthday was a cold that had kept B from having a good night's sleep or an effective nap in about five days, so it wasn't his happiest day, and we definitely didn't have any interactions with friends. The low point of the day was at dinner time when, with his two year old reasoning impaired by extreme exhaustion, he flung himself out of his booster seat at the table and gave himself an ugly black eye on our dining room bench. The angle of this picture doesn't do justice to the nasty bruise down the right side of his face. At the doctor's office, B was declared infection free (stupid virus). 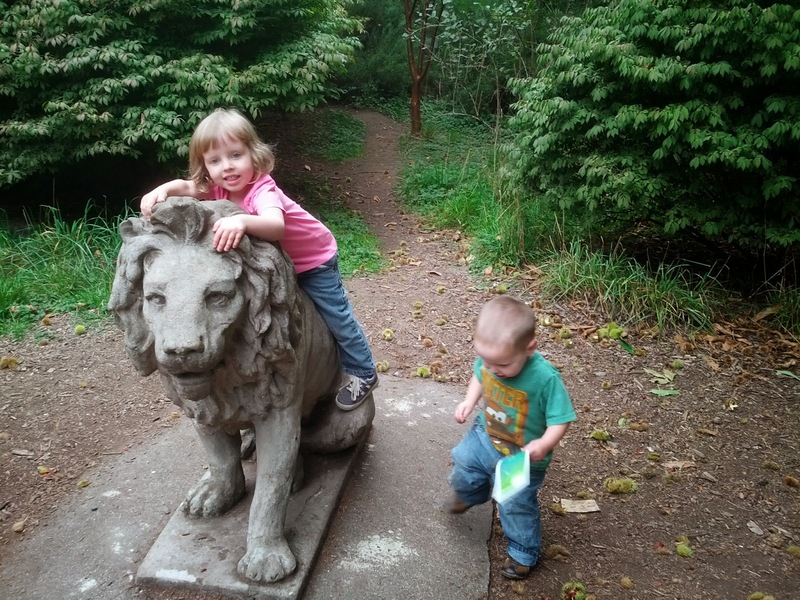 He is 35 inches tall (creeping up on Eloise), and weighs 29 lbs. 6 oz. He didn't scream his way through his exam, but he whined for me to hold him the whole time. He seemed surprised when it was quickly over, without any shots or serious discomfort. B is a joy to be around. He lights up our home with his energy and excitement. 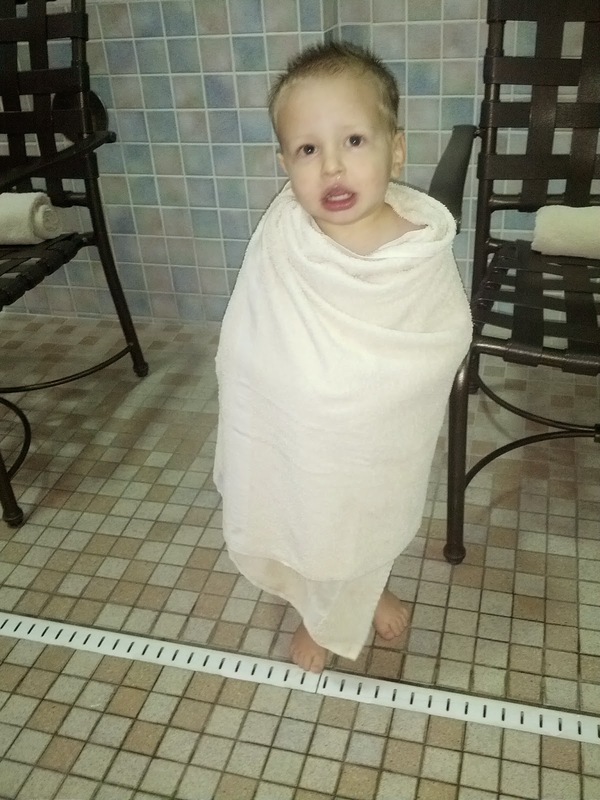 He is going to be a great big brother to our new baby BOY next spring. Happy Birthday, B! Happy birthday to the light of my life. . .
from all of us (whether our faces are showing or not). 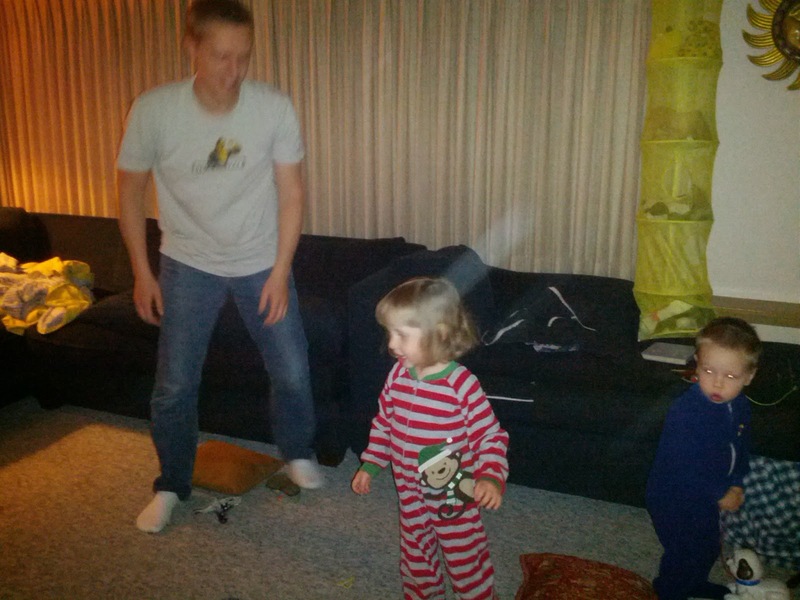 B's face says, "Daddy is turning HOW old!?!" going to soccer games, cleaning up innumerable and unmentionable messes, playing video games with us, or making up jokes that appeal mostly to the three to five year old set, you are definitely the best dad in the world, and we don't want you to forget it! Happy birthday, Todd! You never fail to make us smile. 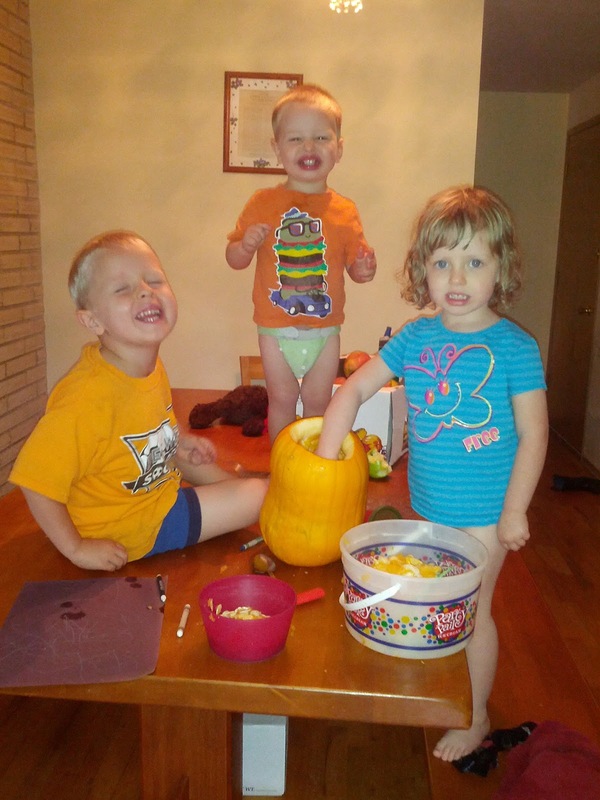 I've never liked anything scary, but these kids make Halloween so much fun. 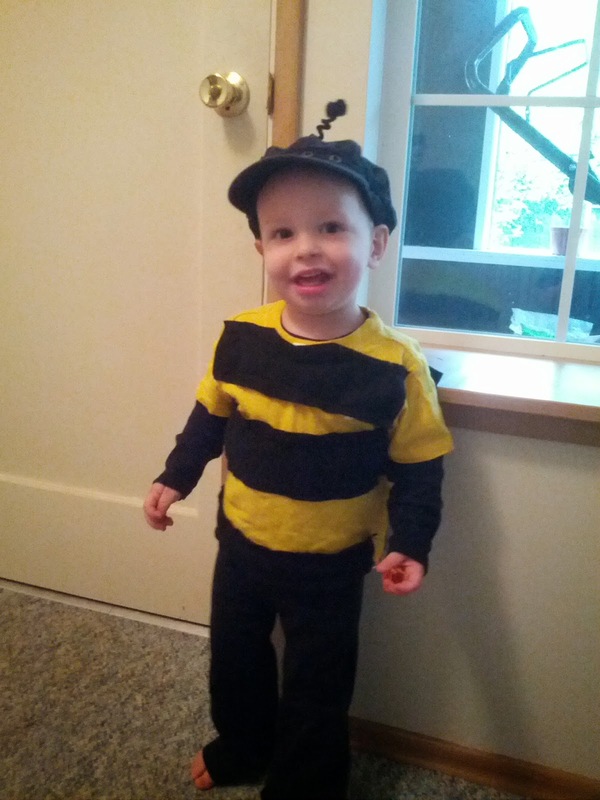 I really wanted B to be a bee for Halloween this year. 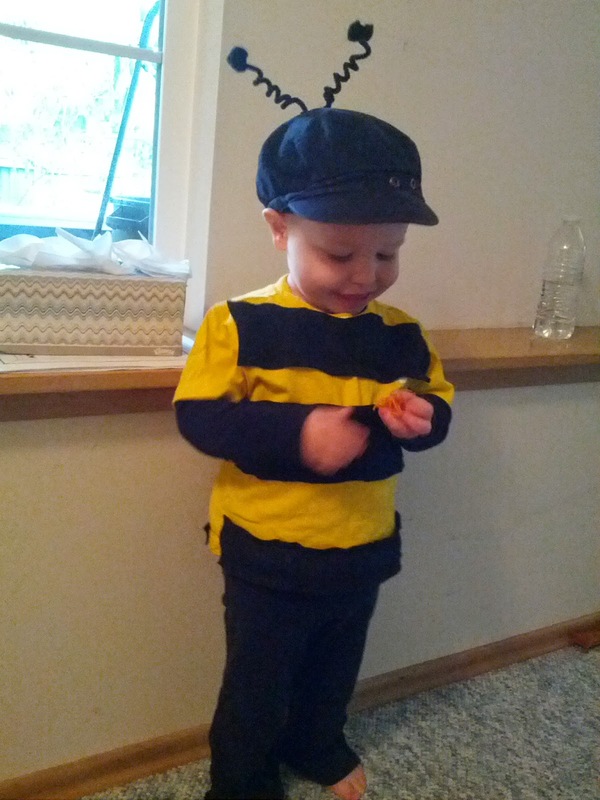 I think he makes a pretty cute bee. He even buzzes on command. 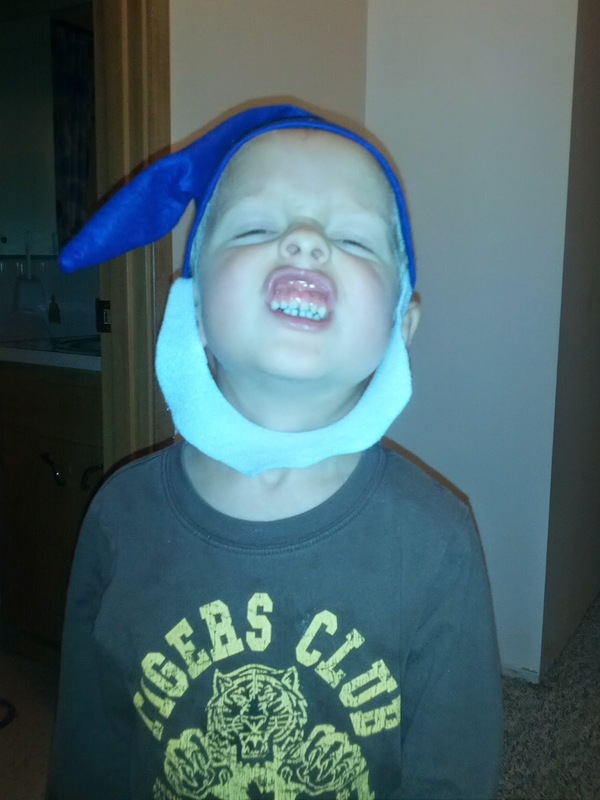 and Jared and Todd were gnomes. Of course making all of these costumes comes at a price. 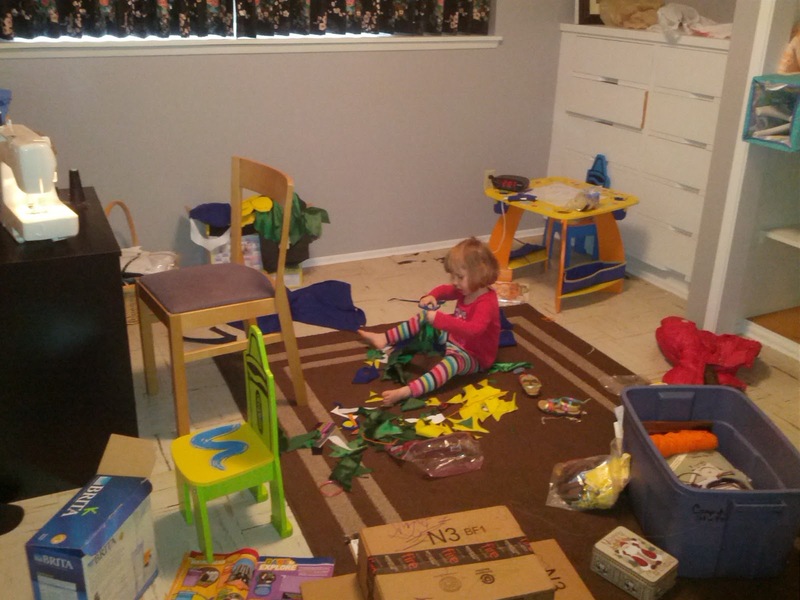 This is how my craft room looked when we were done. 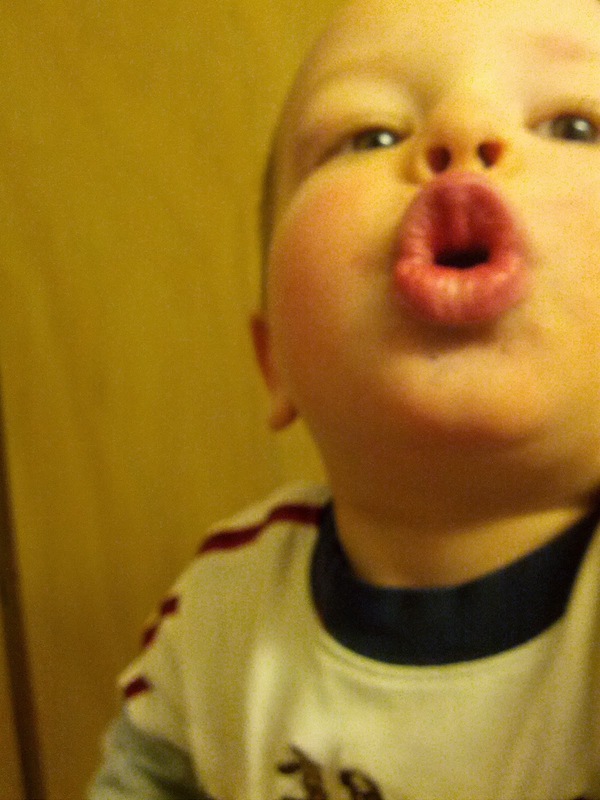 B REALLY likes to ham it up for the camera these days, as evidenced here, and in every picture taken of him this month. 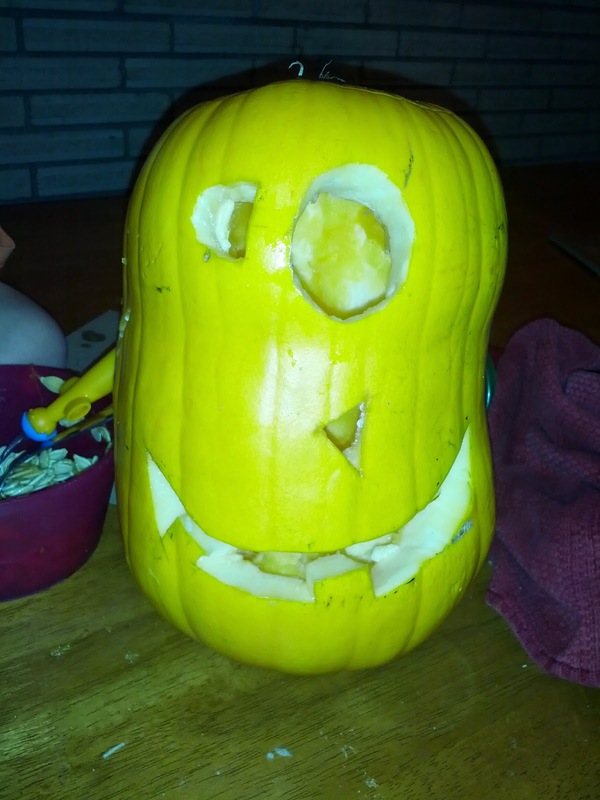 We carved another pumpkin from our garden. Everyone helped scoop out the goop. 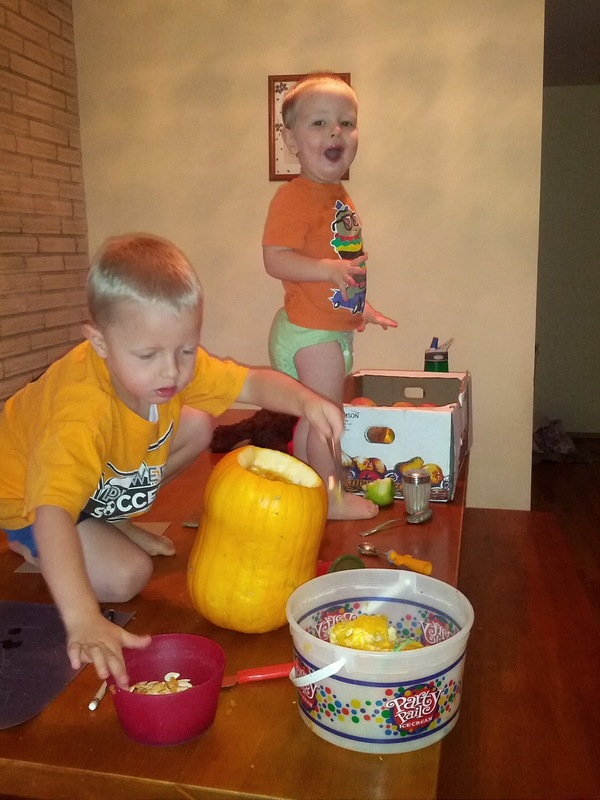 We had gone on a walk in the pouring rain right before carving our pumpkin, and three pairs of pants were soaked. 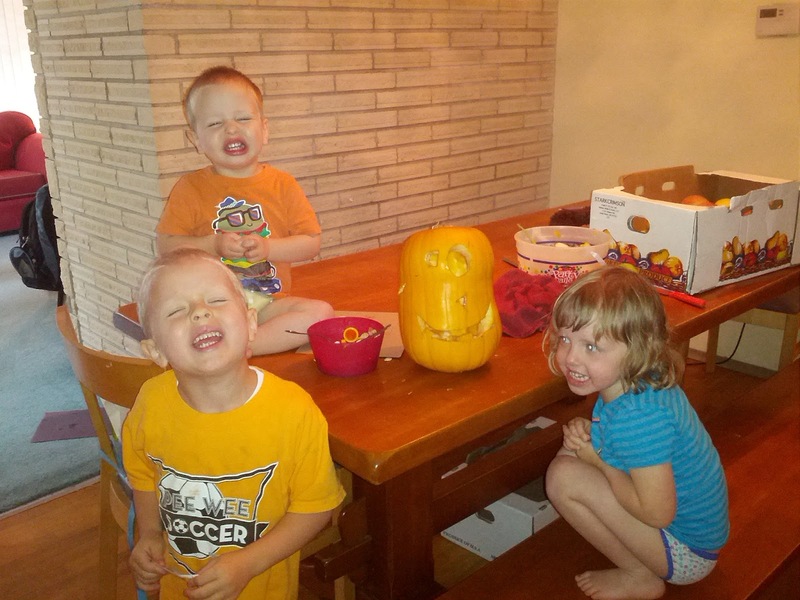 This is the face Jared, Eloise, and B drew on the pumpkin for me to carve out. 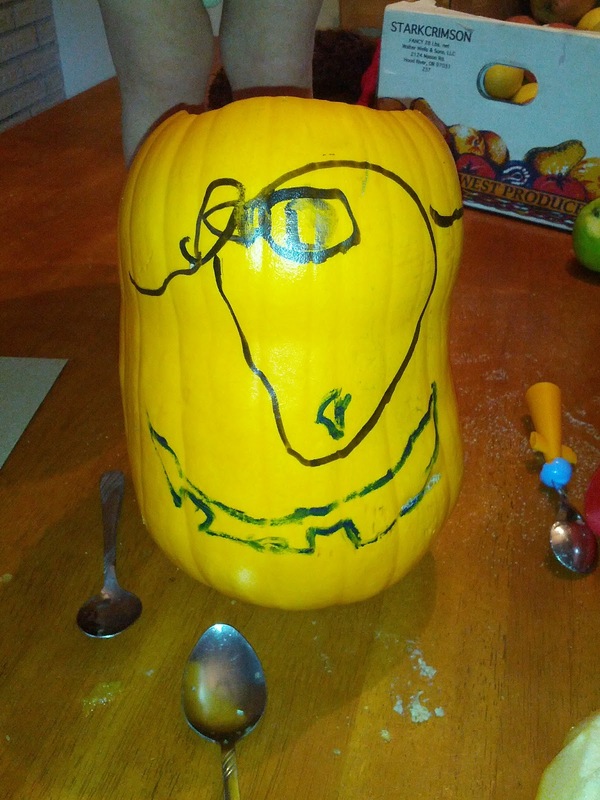 Carving glasses onto the pumpkin was beyond my skill level. 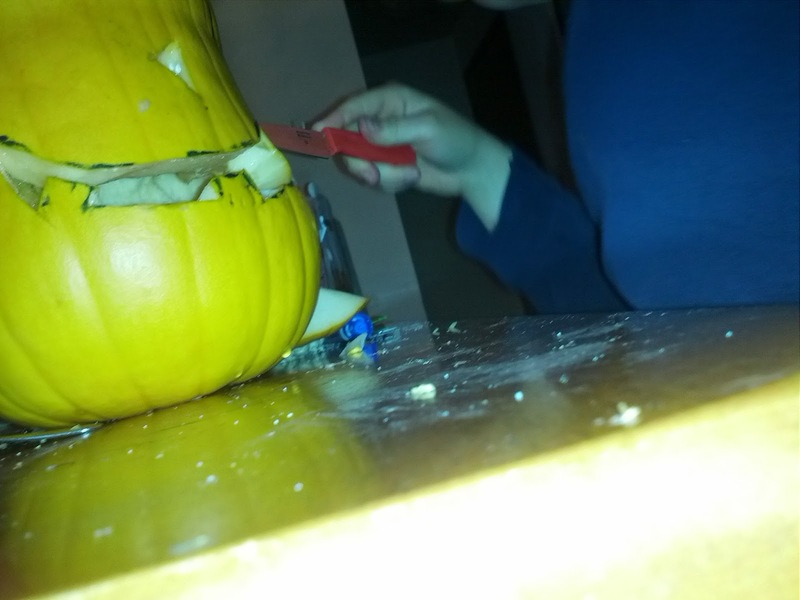 Jared and Eloise took pictures of me carving. Here is our finished product. Jared was very proud of it. 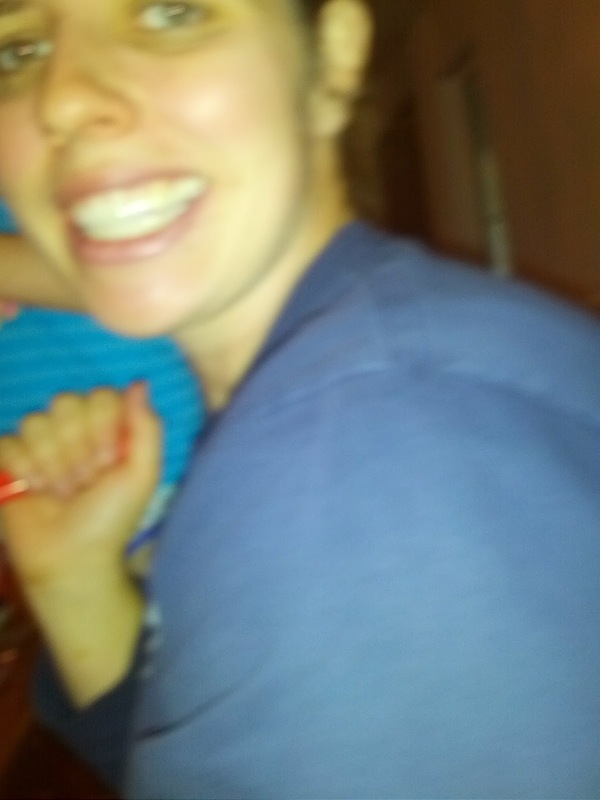 B went nuts with excitement over the candle we put inside it. 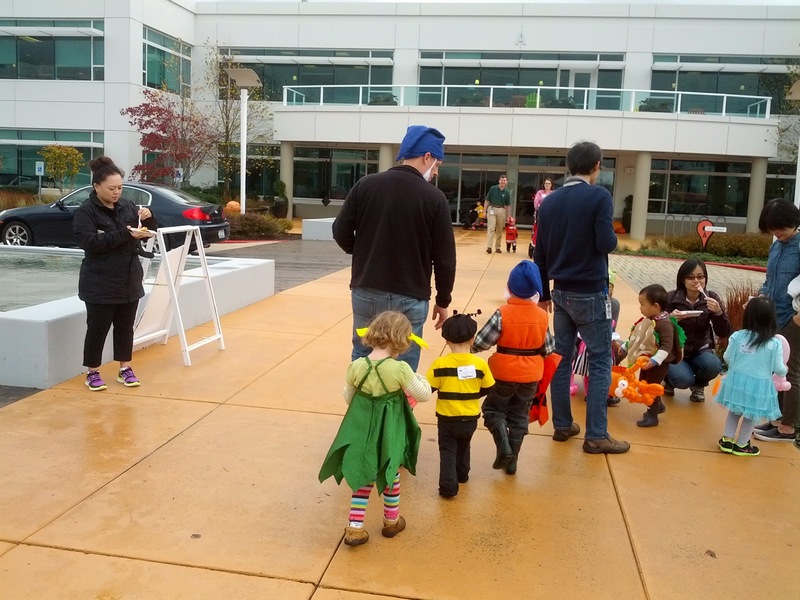 We had a church dinner and trunk or treat on the 24th, and then Halloween afternoon was spent at Google trick or treating from desk to desk. 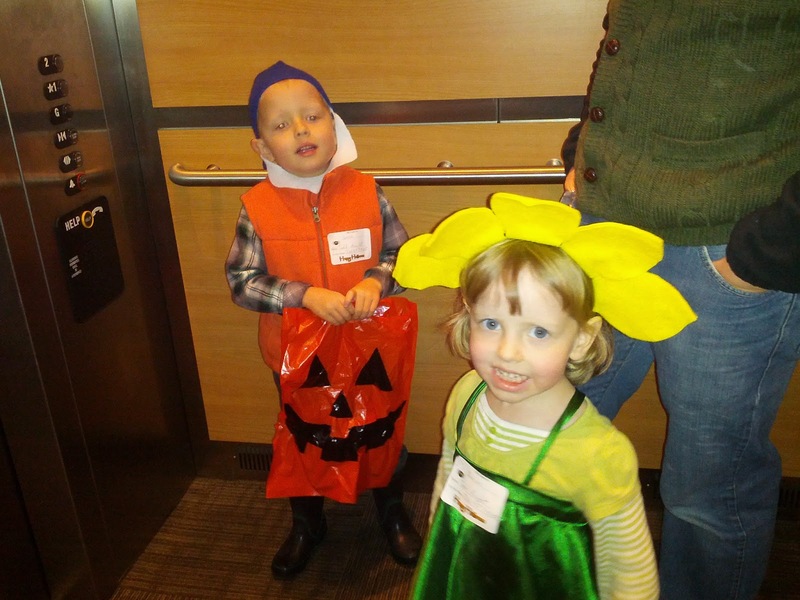 I think that expectations for this Halloween were best summarized by a couple of prayers that Jared and Eloise said. 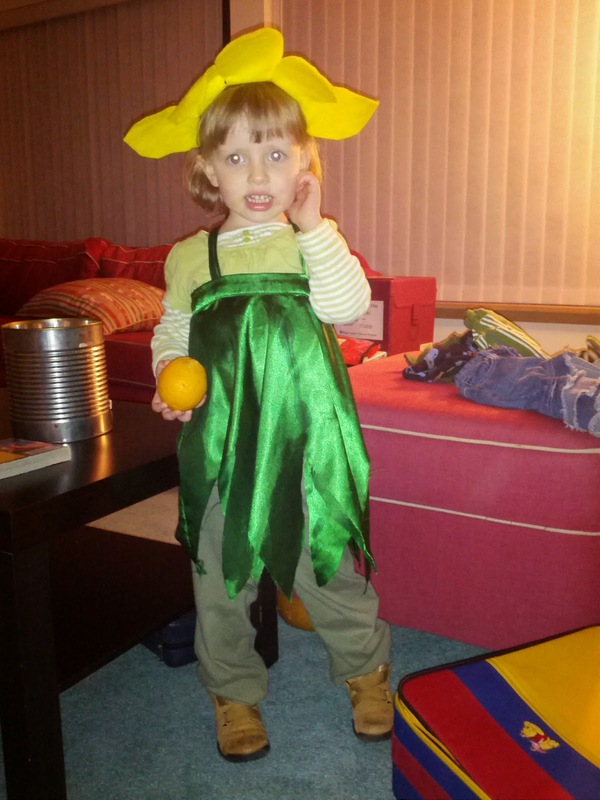 The night before Halloween, Jared prayed, "And please bless the Halloween treats to be prepared and waiting for me." 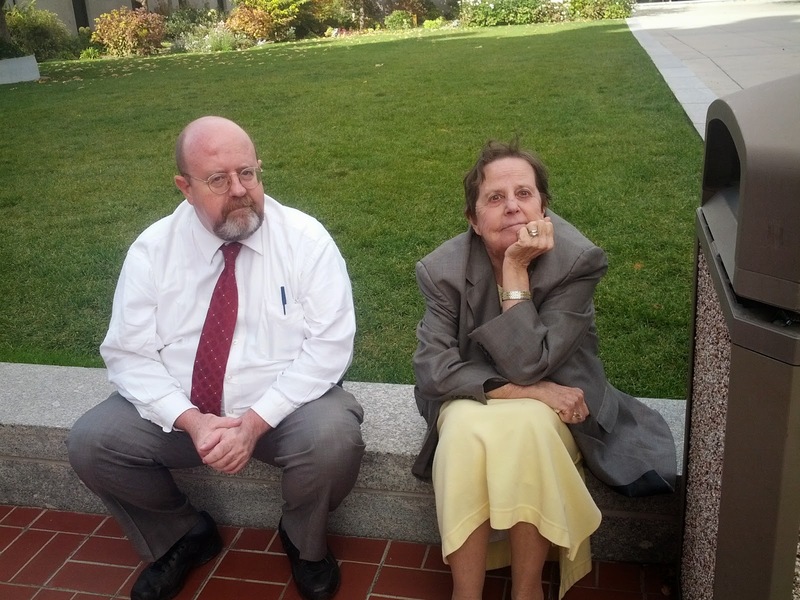 Eloise prayed, "Please bless that we won't see any scary things." One of the highlights for B and Jared was parking several blocks from the Google offices and taking a shuttle bus to the celebration. B kept yelling, "Riding a bus! Riding a bus!" 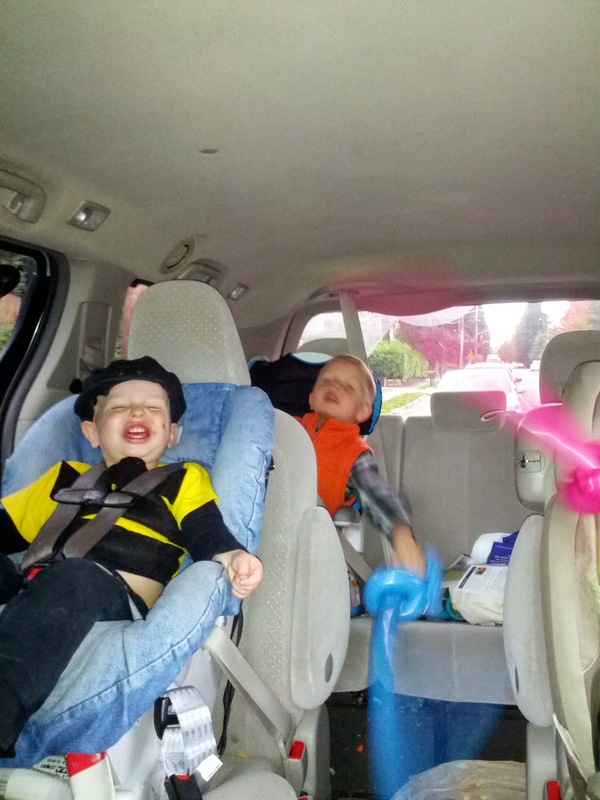 This is a picture I got on the way home of the kids sword fighting with their balloon swords in the car. 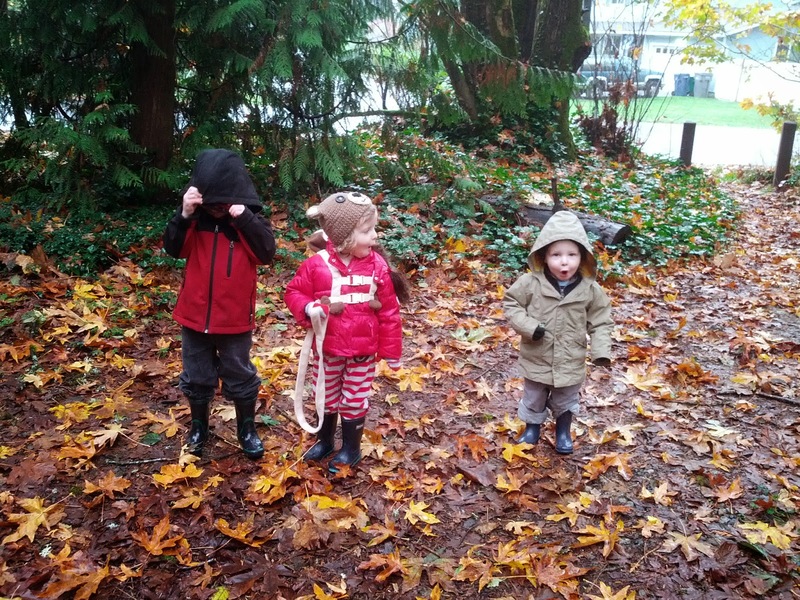 They were not too tired to trick or treat halfway around the block, but then they collapsed on a neighbor's porch, so we knew it was time to go home. 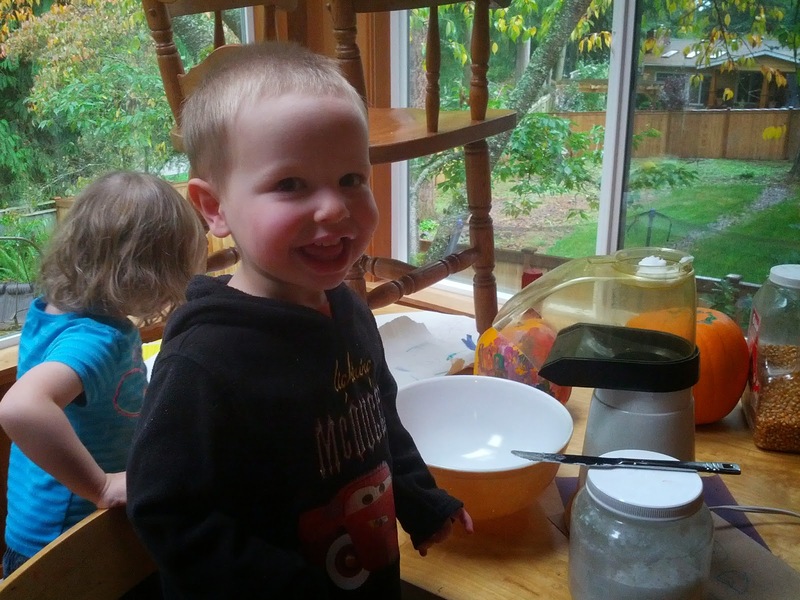 Today we did candy experiments, melting a lot of candy in the microwave, and dissolving a lot of candy in water. The favorite experiment was dropping candy in water to see if it would sink or float. I guess they like to keep it simple. Eloise is already planning her dinosaur costume for next Halloween, so this holiday was a success. Happy Halloween! 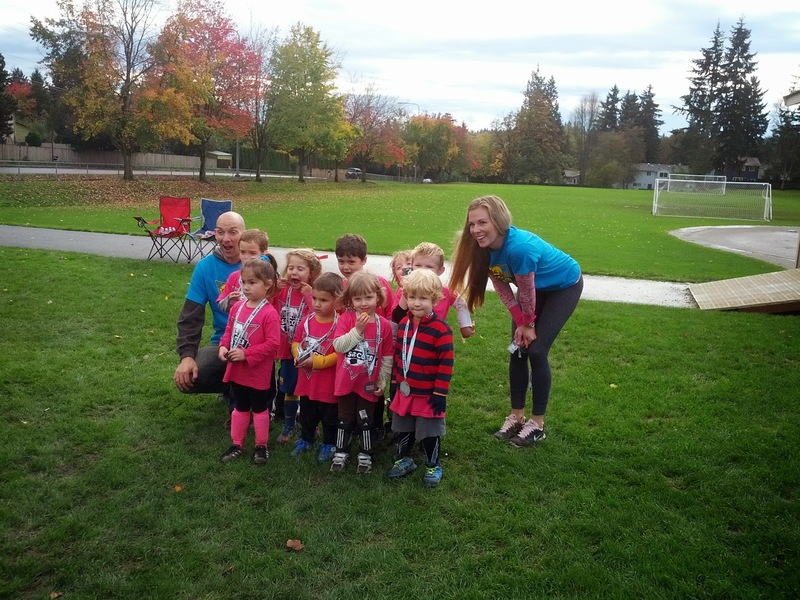 Eloise and Jared each had their last soccer game of the fall season last Saturday. Eloise had a blast this season. 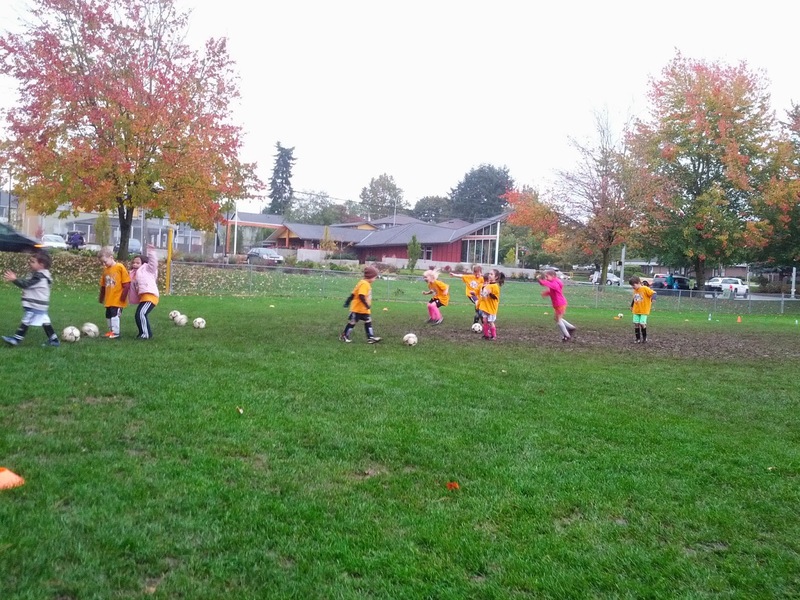 She was very independent on the soccer field, and she hated interruptions from her parents. 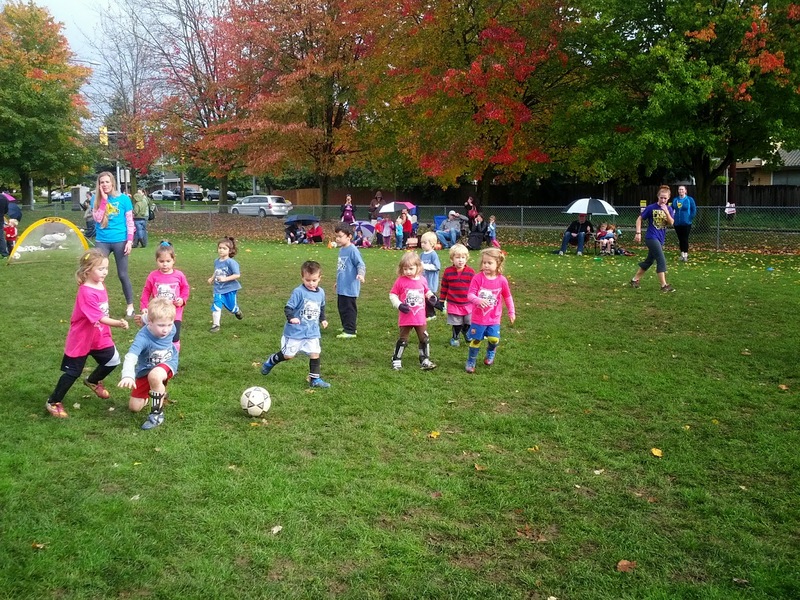 She was one of the smallest on her team, but she loved running after the ball. 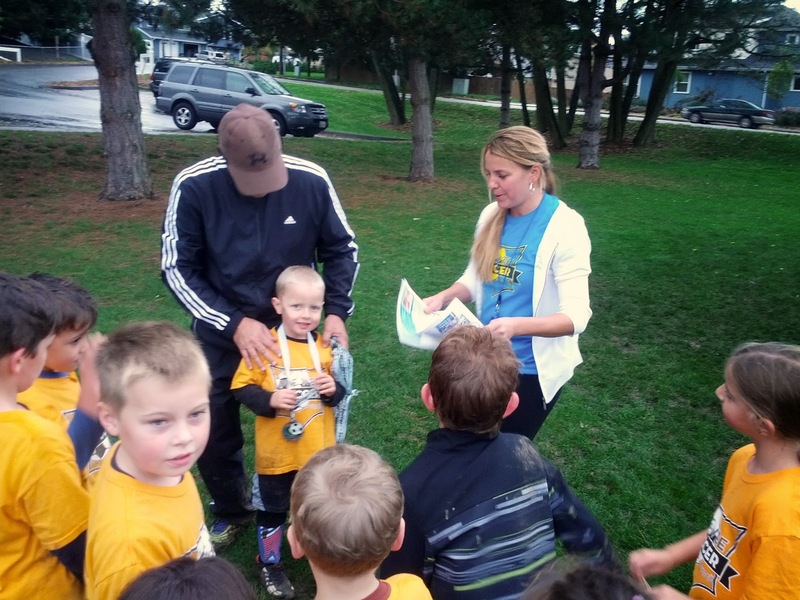 Jared's attention span for soccer is not very long. He liked practicing, when each person had their own ball, but he lost interest quickly when the game was being played. His coaches were great, as were Eloise's. 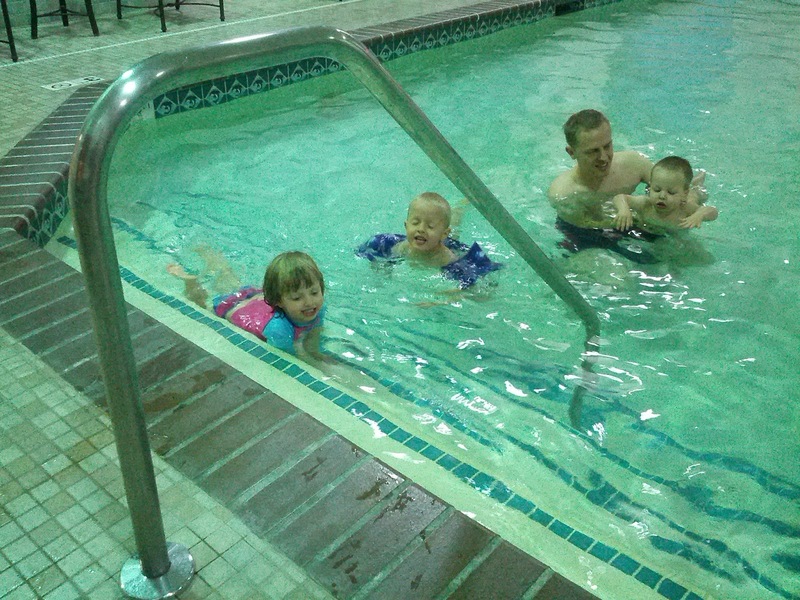 They were bubbling over with enthusiasm all of the time, which made the game much more fun for the kids. It was a great soccer season. Eloise and Jared are already asking when spring soccer will start. 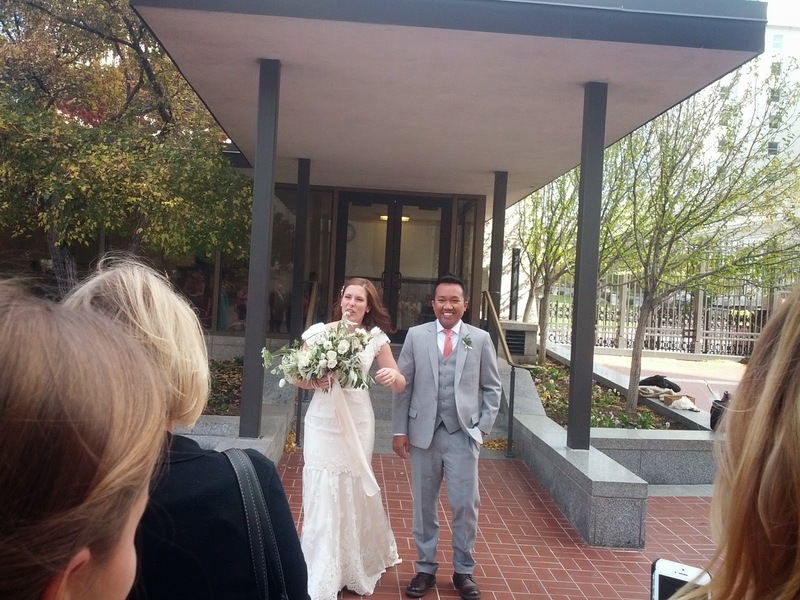 My cousin, Katie, got married on October 21. 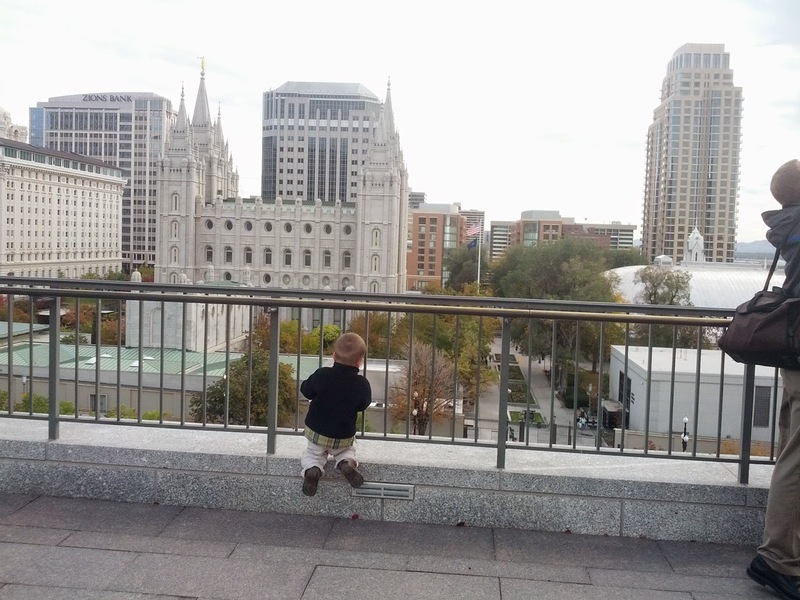 We made a whirlwind trip to Utah to see her get married in the Salt Lake temple. 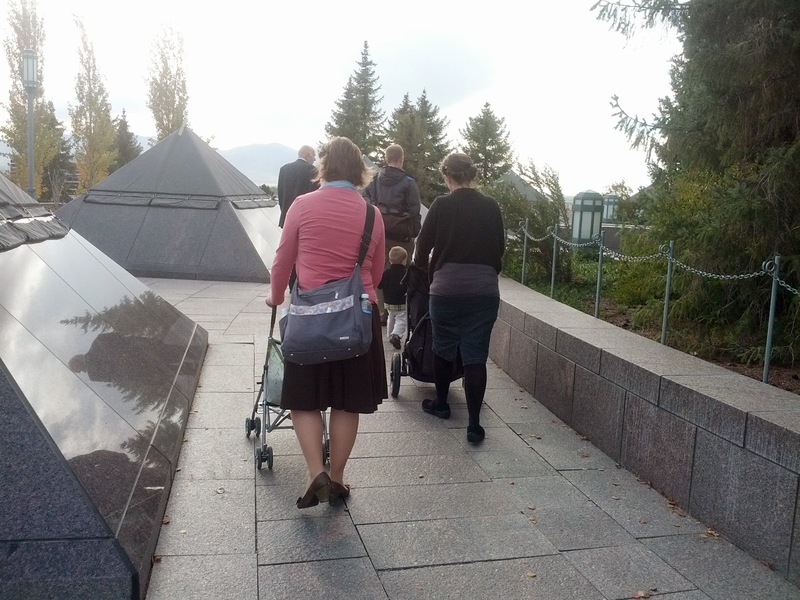 Jared gave a talk in the primary program on October 19, so we left on October 20 in the morning. I thought leaving at 6:30 would be early enough to dodge most of the city traffic, but commuters start early around here. 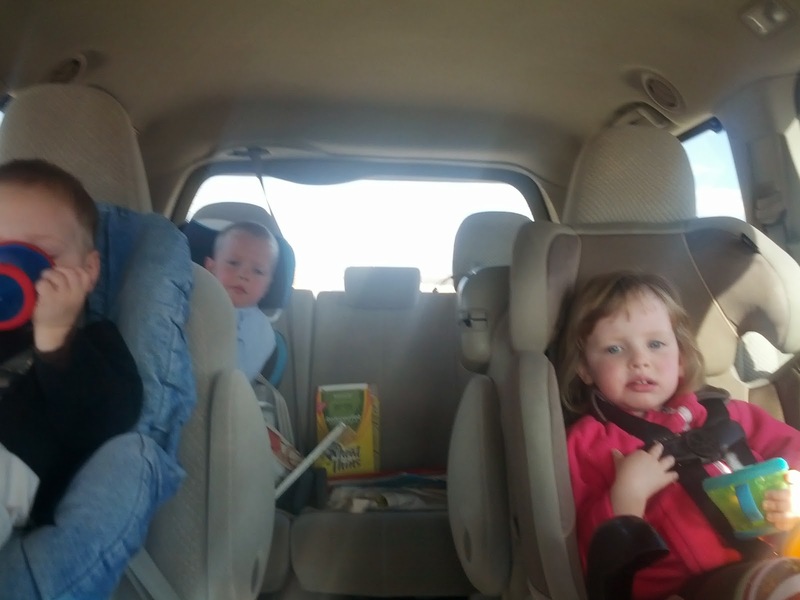 The Knight children are champion road trippers. 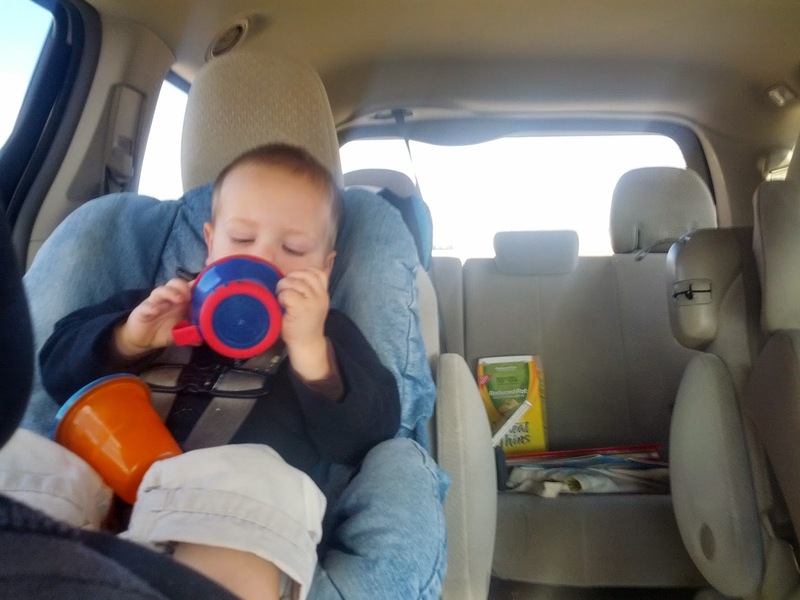 It took three days spent mostly in the car before even Benjamin started to object to getting back in his car seat after every stop. I was impressed at how self contained everyone was on this trip. I was hardly in the backseat at all. I got to read an entire book and prepare a lesson to teach the following Sunday while Todd listened to his book and the kids entertained themselves with books, notebooks, music, snacks, and toy cars. 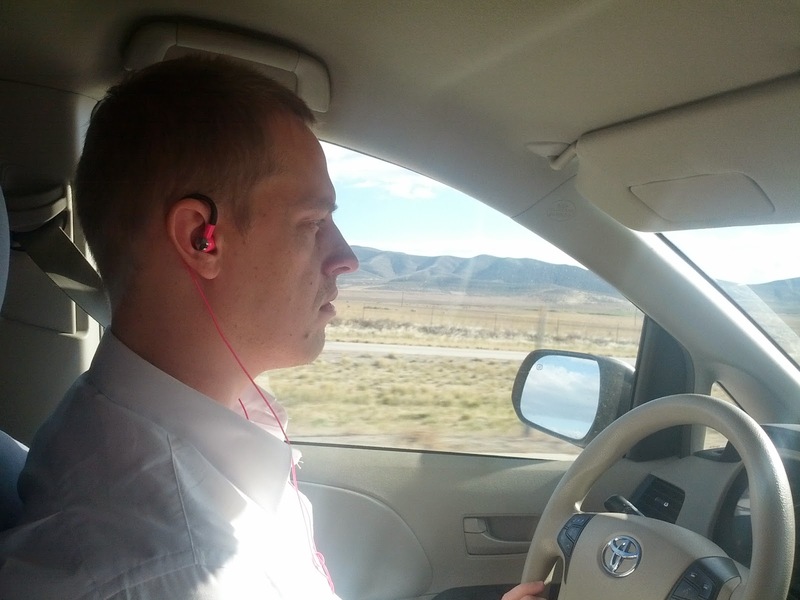 We stopped near Twin Falls the first night, and then drove to Salt Lake on Tuesday morning. It was great to get to see family, even if the visit was very short, and a lot of faces were absent. 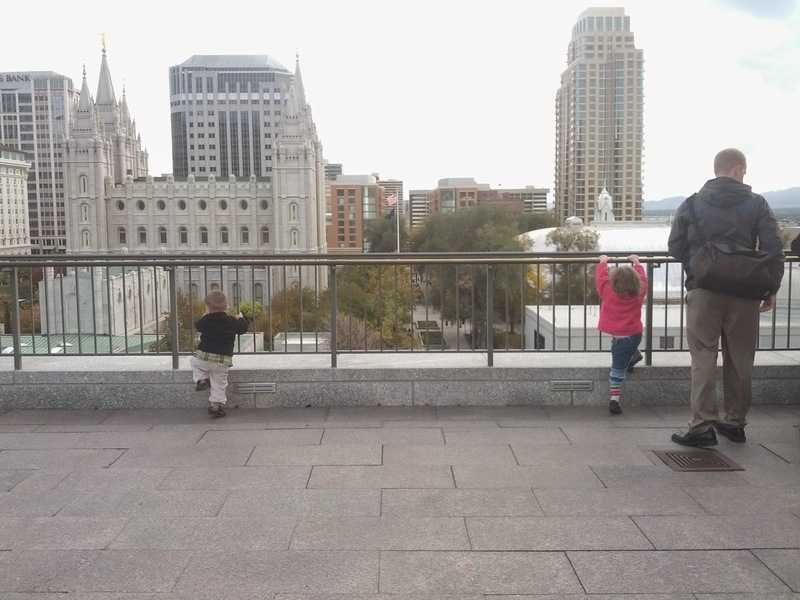 My cousins Carly and Abby watched our kids in the temple annex while we attended Katie and Herb's sealing. 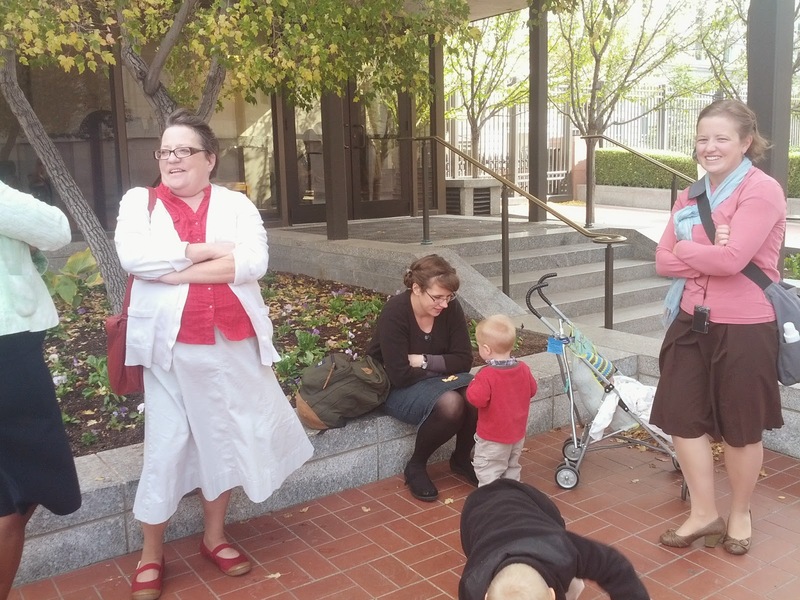 Here is the crew in the courtyard outside the temple awaiting the bride and groom. How cute is this squishy little baby James? This is the first time we got to meet him. He isn't really very little. He is a six month old that weighs only four pounds less that Benjamin. I'm so glad we got to be there for Katie's wedding. We haven't seen enough of her in the past few years, possibly because she spends so much time in Thailand. After the wedding we toured the roof of the conference center and went looking for dinner before heading the the wedding reception. It was great to get to spend the afternoon with Anni, Cheyenne, James, and McKay, even if my feet hurt from all of the walking by the end of the day. The day had been too long before the reception started, and B, after only a twenty minute, much-too-late nap, had a hungry and tired meltdown. He calmed down enough to eat a piece of cheesecake and bury his face in my shoulder when I went to congratulate the bride and groom. 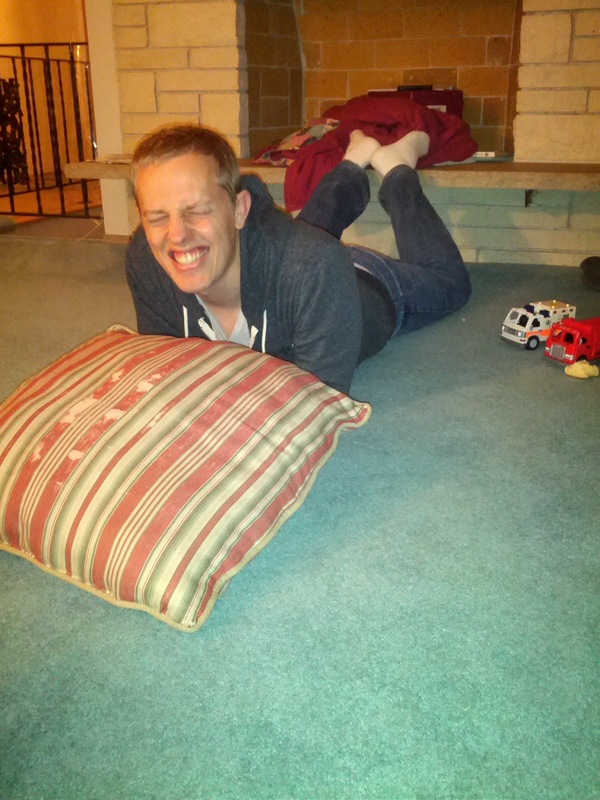 We spent the night and the following morning at the Christensens' apartment. We were so excited to see them again! 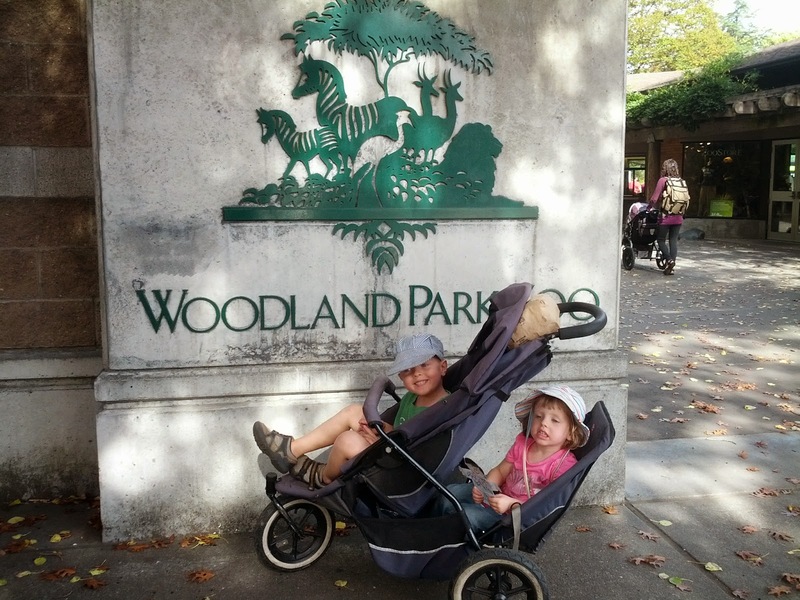 We can't wait for them to move back here permanently next year. Anni stopped by to say goodbye on her way to the airport, and we left shortly after she did so that we could spend Wednesday night in Boise. 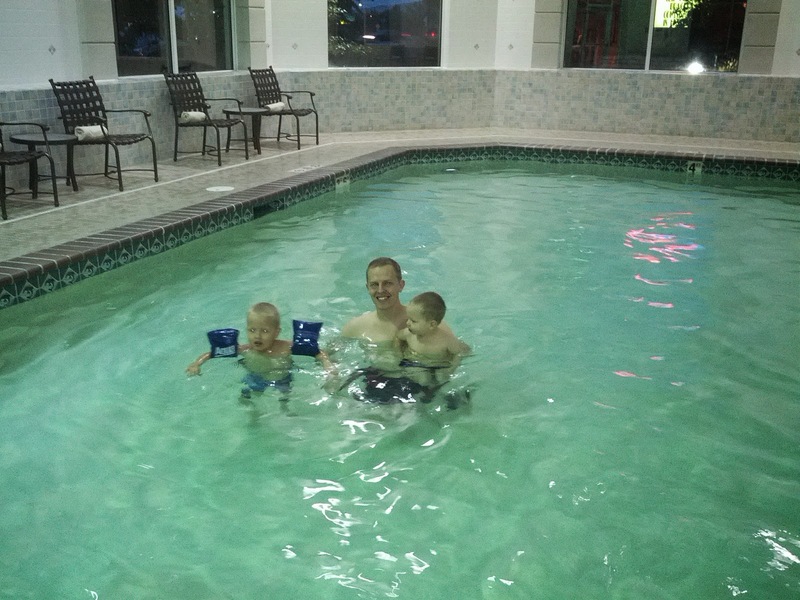 We got in some hotel swimming and a fair night's sleep before the long trek home on Thursday. All in all it was a whirlwind of a week. I can't speak for Todd, but I would do it again in a heartbeat. We never get to see enough of our family and friends who are spread across the country. October has gone by so quickly! I thought that the cooler weather would slow down the pace of our lives, but it most certainly has not. 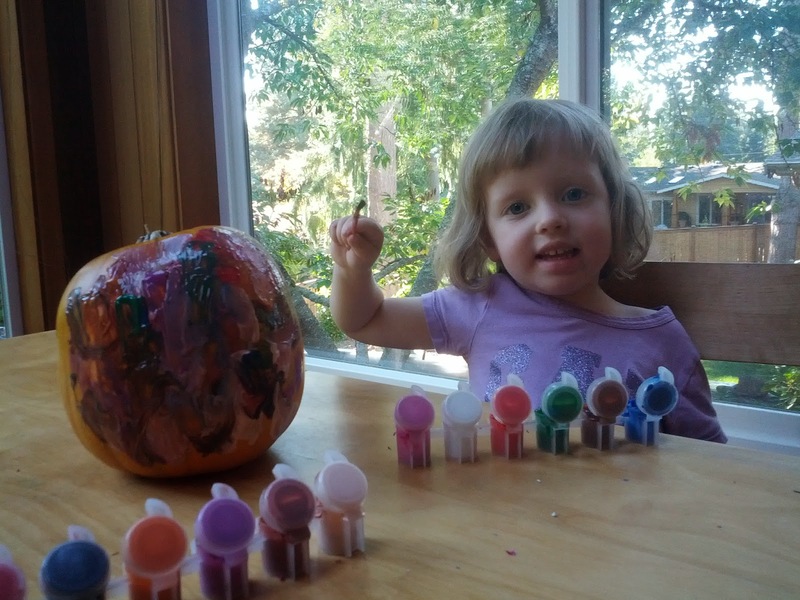 As soon as it was October, Eloise was ready to paint her pumpkin that we grew. 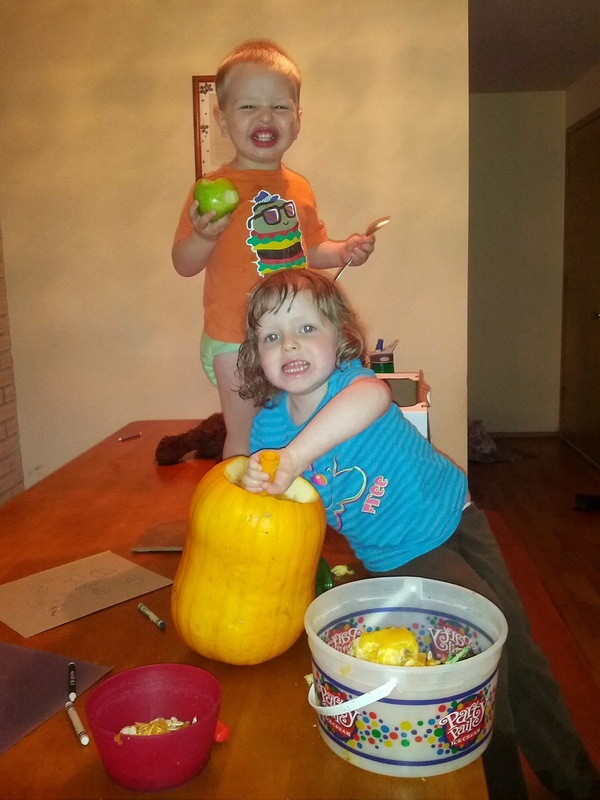 Our garden produced four good pumpkins this year. 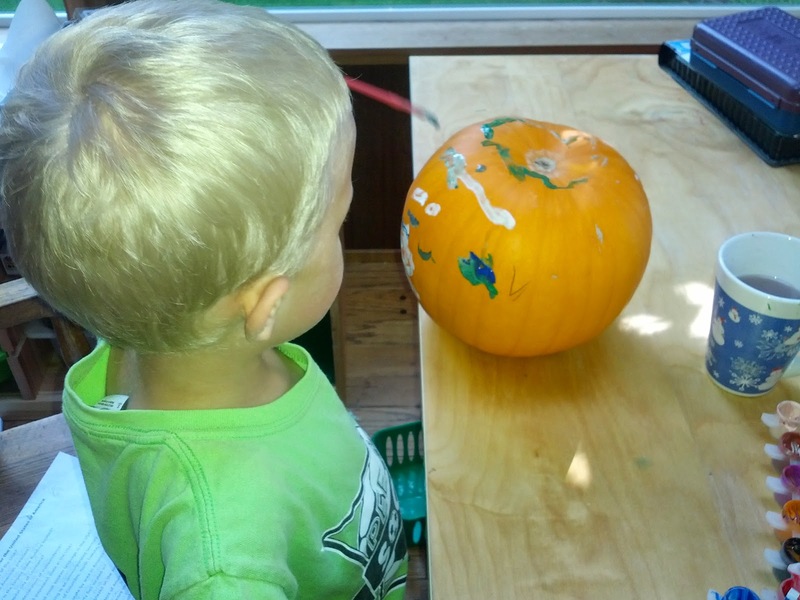 I think Eloise's pumpkin was impressionist. Jared's was more in a Picasso modern style of face. Before the rain set in, we had a picnic and outing to the farm. Benjamin LOVES animals. I don't know what his favorite is because every single living thing gets him wildly excited. Sheep and chickens had him the most wound up on this trip. 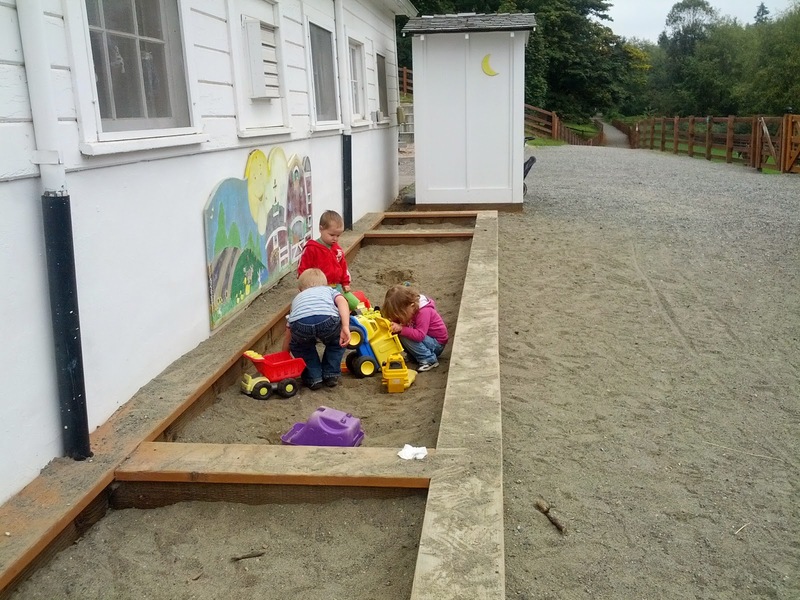 I think he would have found the pigs more interesting if they hadn't been adjacent to this sand box full of trucks. He did get distracted from the sand to track down a crowing rooster. 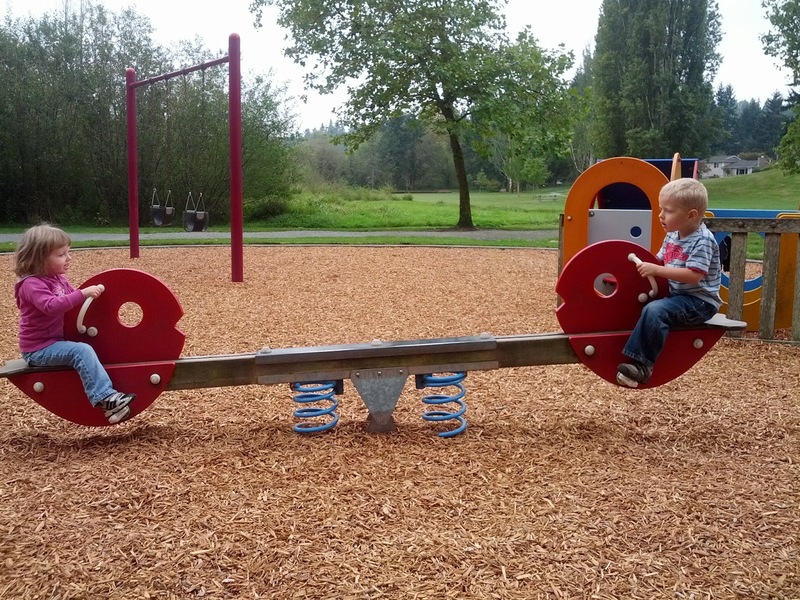 Remember how seesaws used to look when we were kids? This high tech bouncy machine is a far cry from the heavy, homemade contraption that broke my foot when I was eight. In other news, B moved into a big bed. 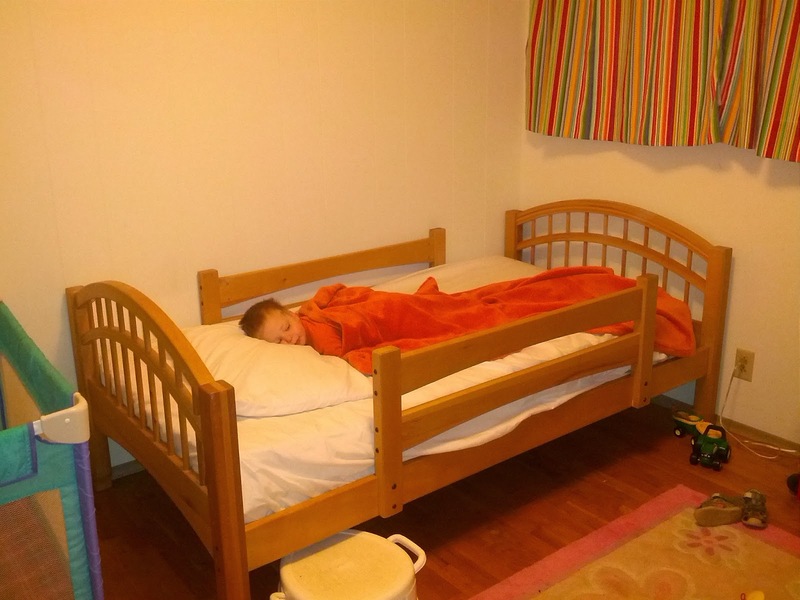 We set it up in his room expecting him to make a slow transition, but he had moved over within three days, with no interruption to his sleep. I would say it has gotten significantly harder to get him to get out of bed now that he can get in and out himself. He likes to have a fuzzy blanket (his "fuzzies"), and his Elmo doll with him when he sleeps, and a lot of the time around the house for playing sleep. He looks so small in the big bed, but also so big. These kids grow way too fast. B is currently in the same shoe size as Eloise. I brought the children with me to visit the midwife and hear the new baby's heartbeat. 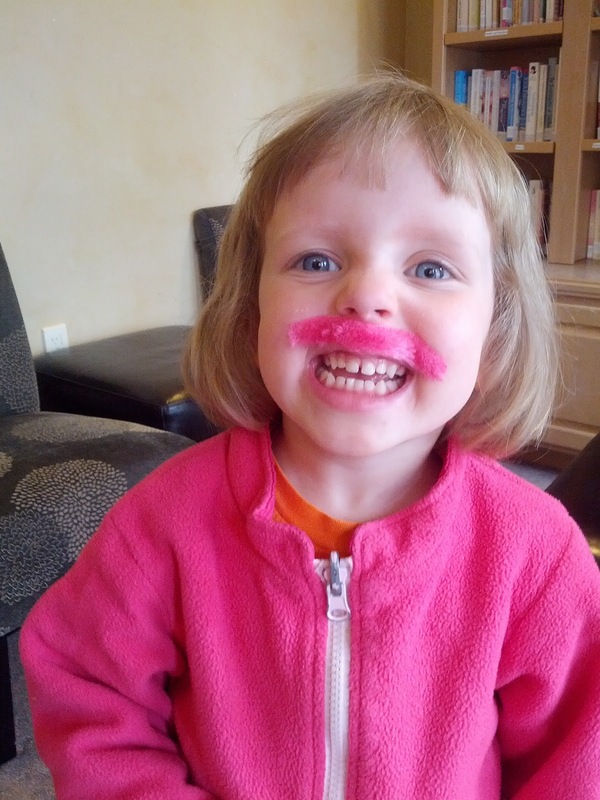 Eloise sprouted a pink mustache on the way home. 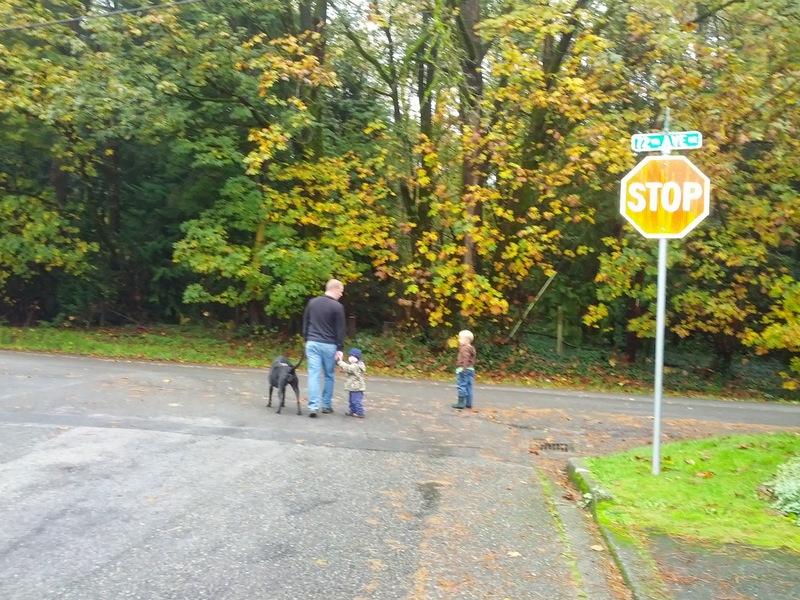 We walk our dog every morning, rain, or, less frequently, shine. Jared usually rides his bike. 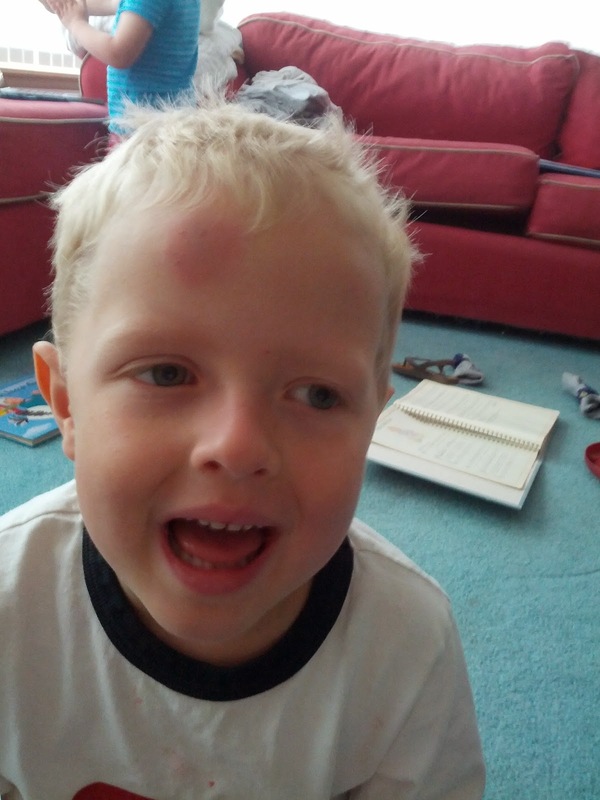 One day he was having a great time pretending to fall off his bike and land "splat!" when a great accident occurred, and he actually fell down, splat! Of course he was right in the middle of the road when it happened, and there were cars coming both directions who had to wait for me to park the stroller, disentangle him from his bike, comfort him enough to get him to walk to the side of the road under his own power while I hauled his bike, all while holding a leash in one hand. Fortunately he caught himself. . . with his forehead. Ah, childhood. 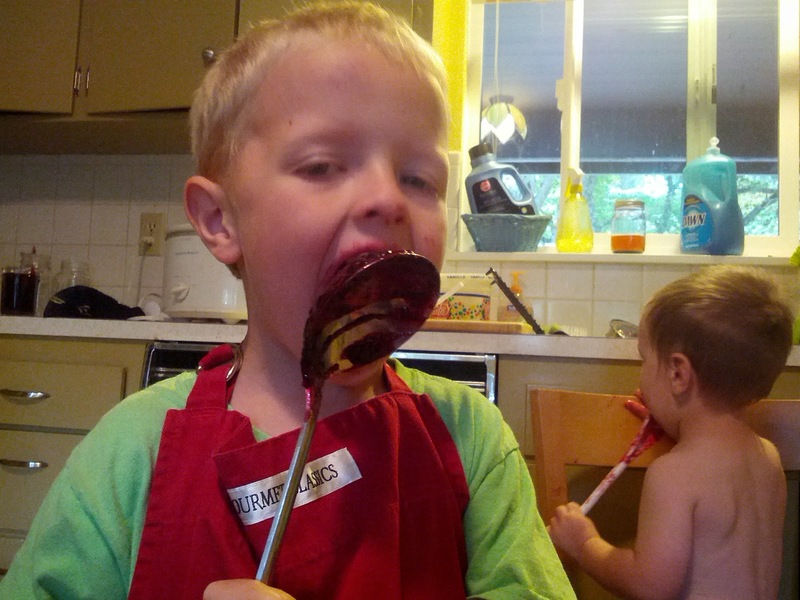 The children have been begging to make blackberry jam for months, and I guess the pace of life has slowed down a bit, because we finally found an opportunity. 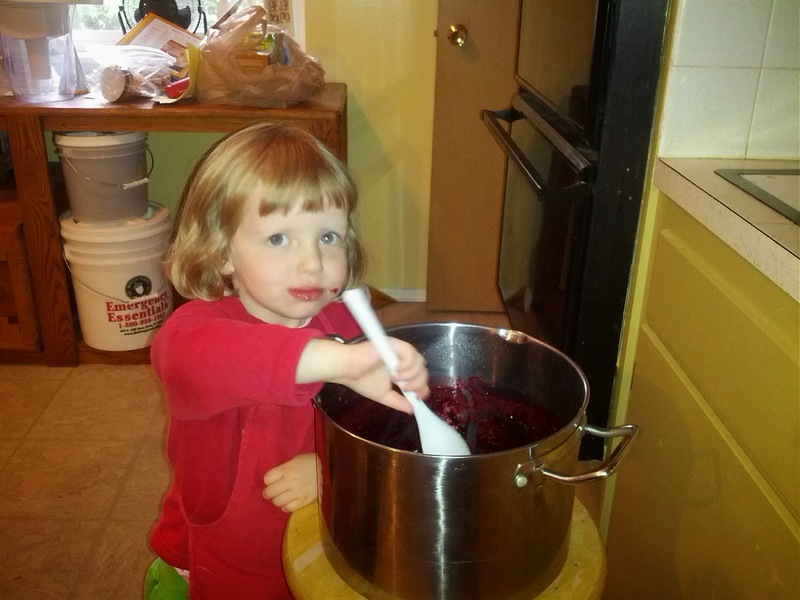 Why do you think they like making jam so much? We had to have an exterminator come, as the fleas resurfaced. The exterminator actually had to come twice, as the first visit didn't manage to completely eradicate the flea threat. 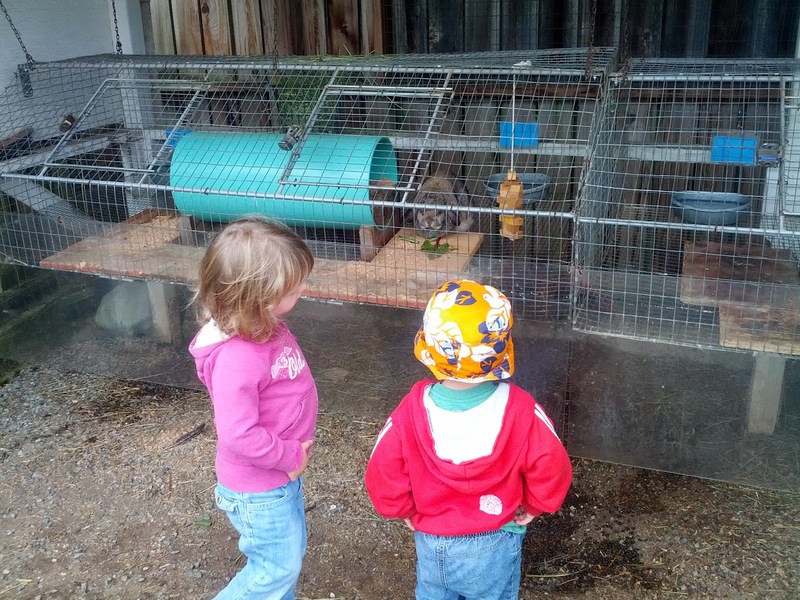 During the first exterminator visit (October 13), we did the unthinkable. 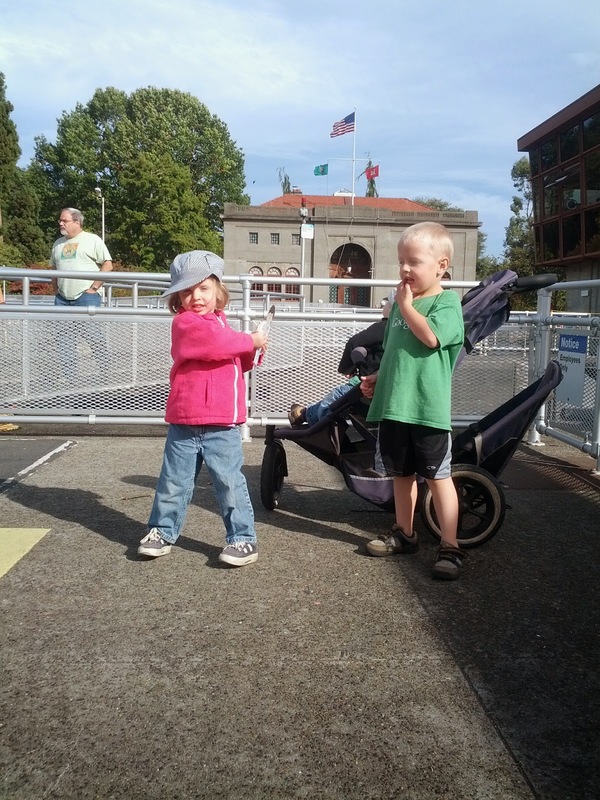 We went to Seattle and visited both the locks and the zoo on the same day. I was a little too much, but we got to have our delicious fish sandwiches, see salmon in the fish ladder, and get a spectacular show from the penguins. 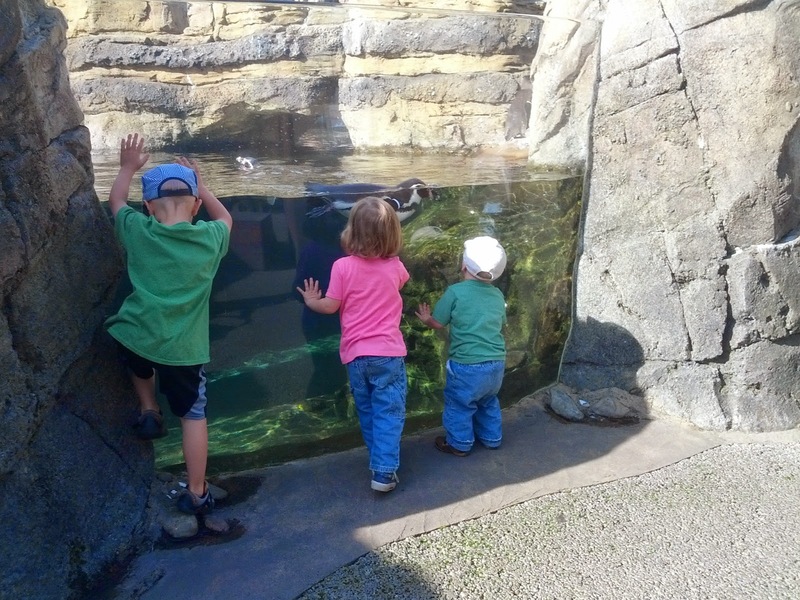 Penguins may be B's favorite animal after this experience. 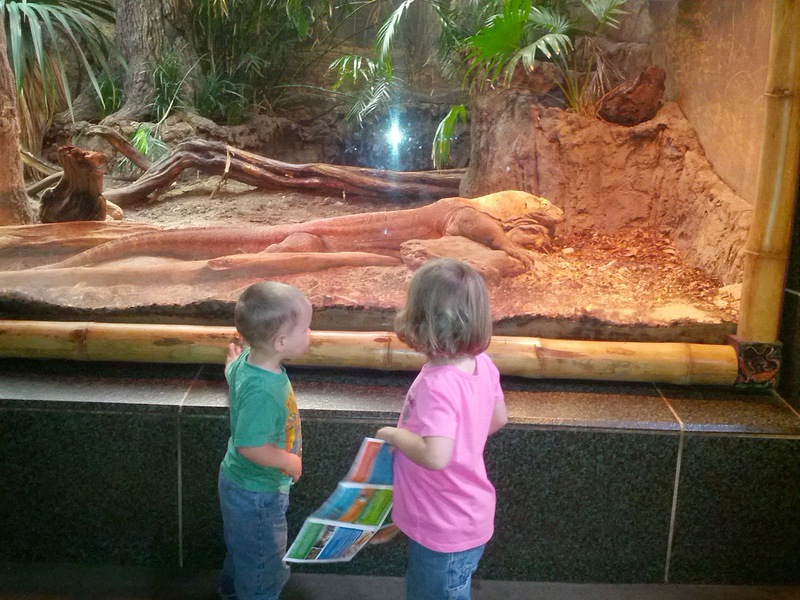 Eloise with a komodo dragon. She was excited about this because her soccer team this season was the komodo dragons. 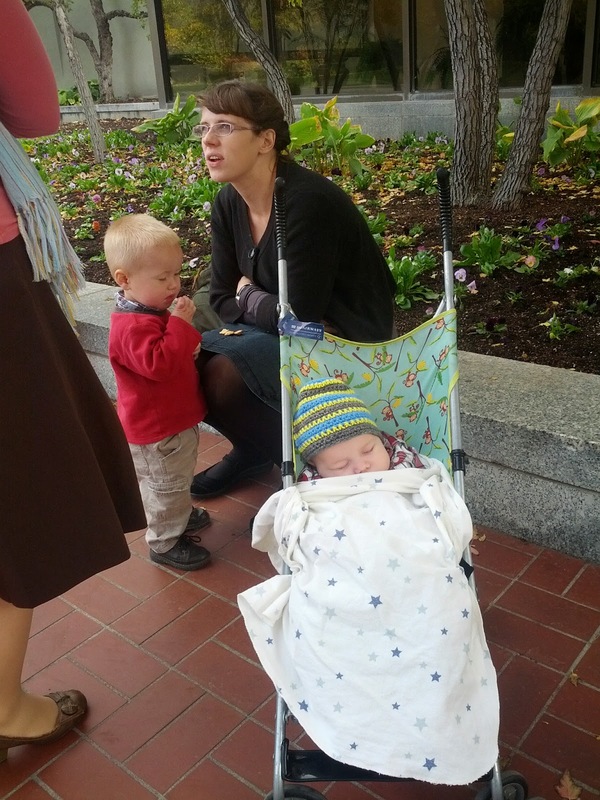 A spectacularly ill-timed and horrendously messy Benjamin diaper (this is beginning to be a common occurrence) was the final indication that it was time to haul the troops back to the car for the ride home. . .
just as soon as we climbed on every statue along the way.